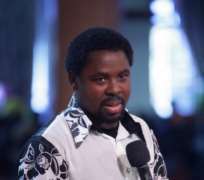 Nigerian Pastor, Prophet Temitope Balogun (T.B) Joshua, is at it again. Smarting under barrage of immoral exposures by some top former members of his Synagogue Church of All Nations, Prophet Joshua has resorted to his usual blackmail tricks to restore back his battered image. Last Sunday, the badly bruised General Overseer of the Synagogue Church of All Nations, attempted albeit unsuccessfully, to steal the glory associated with the triumph of the Ghana Under20 team- the Black Satellites in this year's World Youth tournament held in Egypt. T.B. Joshua told a courted group of Journalists who parade his church every Sunday for crumbs that he called to tell Black Satellites coach, Sellas Tetteh that the team's success rested with him and that was the reason why the Ghanaian coach heeded to his (Joshua) advice to allow Satellites captain, Andre Dede Ayew to take the first of the penalty kicks in the final match against Brazil. Shockingly what otherwise was expected to be a private “counseling' to a friend coach was recorded by the Nigerian Pastor and posted on the internet for the world to know that it was his divine intervention that made it possible for the Satellites to win the World Youth Championship. However as the agitation by Ghanaians against his apparent undue sought of glory in the Satellites success reached a hysterical level, Joshua and his cohorts have back-tracked, removing the video recording of the so-called conversation he had with Coach Sellas Tetteh from his web-site. In-depth investigations by TODAY have shown that the trick on the Satellites' coach has been part of the Joshua grand scheme to take advantage of events and people, especially famous and well-known global figures to perpetuate his self-sought glory. He had done it against Nigerian footballers Nwankwo Kanu, Daniel Amockachie, Presidents Frederick Chiluba, Omar Bongo, Pastor Chris Oyakhilome and many others. After being declared unfit to continue with professional football around 2003, scary family members of Nigerian international, Nwankwo Kanu sent the footballer to Prophet Joshua at his Synagogue Church where after some consultation and prayers, Kanu was declared fit by Joshua at the Synagogue Church. The event remained exclusively at the Synagogue Church. But that clean bill of health given by Prophet Joshua proved to be a huge deceptive hoax. The player later sought operation of his heart defect in the United States. Immediately after the successful operation, Joshua released a video tape recording of his meeting with Kanu that sought to portray that the footballer had his healing at the Synagogue Church. Obviously enraged by the Joshua action, Nwankwo Kanu had to appear on some Nigeria televisions to deny the Joshua scam. Similarly, Joshua boasted that he healed another Nigerian player, Daniel Amockachie of a nagging injury that for years jolted the career of the player. Indeed video recording on the footballer's case was sponsored by the Synagogue Church and put on some leading Nigerian televisions. In the end, all those who followed the gimmick came to realize that it was false. That injury eventually ended pre-maturely, the football career of Daniel Amockachie. The Nigerian Pastor once told the world that he has cured former Zambian President, Frederick Chiluba and the late President Oumar Bongo of Gabon of their cancer ailments. Sadly, Chiluba is still battling the ailment, while Bongo died sometime this year of cancer. Joshua also played a fast one on the head Pastor of the Christ Embassy Church, Pastor Chris Oyakhilome, when after inviting him for an ordinary visit and familiarization; he clandestinely recorded the visit and later played to the Nigerian people to create the impression that the Christ Embassy Pastor has endorsed him as one of the best Pastors in Nigeria. That was the time Joshua had virtually been ostracized by the Nigerian Pentecostal Churches and needed somebody with a stature like Pastor Chris to help him restore back his plummeting image within the Nigerian Pentecostal Churches. Although Ghanaian coach of the Satellites, Sellas Tetteh has confirmed that indeed he sought divine intervention through the Nigerian Pastor in the said match, many Ghanaians who TODAY spoke to on the issue wondered what the real motive was for T.B. Joshua to record and put a private conversation between two friends on the internet. According to Egya Awotwe of Cape Coast, many Ghanaian Pastors and even other individuals sought God's help and therefore thought Joshua's claim cannot be correct. “What is T.B. Joshua talking about? Was he the only person who prayed for the Satellites' success? Even traditionalists and non-Christians and Muslims also prayed for the Satellites”, Wofa Adu Gyamfi told TODAY, and asked rhetorically, “What about the players themselves who pray before and after every match? Is Joshua saying God does not listen to their prayers?